“What kind of diapers should I get for hand washing while living off grid?” This was the question that I asked when I walked into a cloth diaper store while pregnant with my second son. Not a question they get every day! I was quite an anomaly. But the ladies were so helpful. 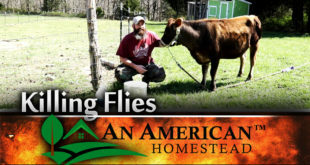 I had been so overwhelmed in looking at the abundance of information about cloth diapers online, but I found nothing that would help me decide what to use for off grid living. Later on, I sang these ladies’ praises everyday as I brought my clean dry diapers in off the line. They recommended that I use a flat diaper. What is a flat diaper? With all of my research on diapers, I had never heard of it. But, as I found out, it is the most tried and true diaper there is, the diaper that my grandmothers used on my parents. Basically it is like a great big tea towel. You know, the kind used for drying dishes. These ladies were telling me that I should use my grandmothers’ diapers. This was so fitting! An old-fashioned diaper for my old-fashioned life. They are cheap! They come in bleached, unbleached, and organic cotton. I bought mine from Green Mountain Diapers. Their price is $12.50 for 6 unbleached one-size flats. I had two dozen of these, as well as 1 dozen of the large flats. I also found some good OsoCozy flats on Amazon for a little cheaper, but I liked buying from a diaper website. I also liked that Green Mountain sent a packet of instructions with my order. It was very helpful to have detailed instructions about the essential pre-washing steps. 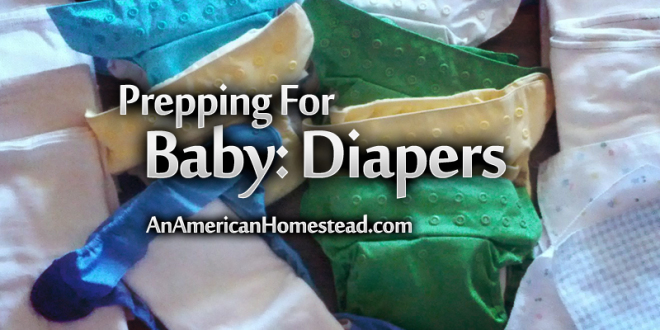 When you are done diapering, they can be used for so many other things. They can be folded in so many ways to fit any size baby. There are some pretty fancy folds out there. I tried the kite fold and the origami fold when Kaleb was tiny. In the end, my favorite was the pad fold. At the smallest setting on my Flip cover and Bumgenius 4.o, I used the one-size flat. I folded it in half and then half again, so that it was in a square. I then folded the square into thirds, so that it was in a pad. When I moved to the Flip’s second setting, the pad folded this way was too short. Kaleb is a smaller boy, but at close to two, he still fits the second setting. I like using the large flat folded the same way, and then the top folded down enough to fit in the cover. This provides extra layers in the front where my boy needs them. If more protection is needed overnight, I can put a one-size flat inside the large flat without having too much bulk in the front of the diaper. The pad fold also makes it easier to keep all the diaper edges in the cover, so it doesn’t leak! They get really clean, even with hand washing. They open up completely so that no yucky stuff gets trapped between layers of fabric. They dry quickly on the line. Often in the middle of winter, all my laundry would freeze when I put it on the line. But when the sun came out, my flat diapers were always the first to dry. I have a few inserts that came with my BumGenius diapers. I used these a couple times just to see how they worked. It took them three days to dry on the line, longer than any other clothing. In the summer, the flat diapers usually dry in an hour or so. The regular inserts take all day. 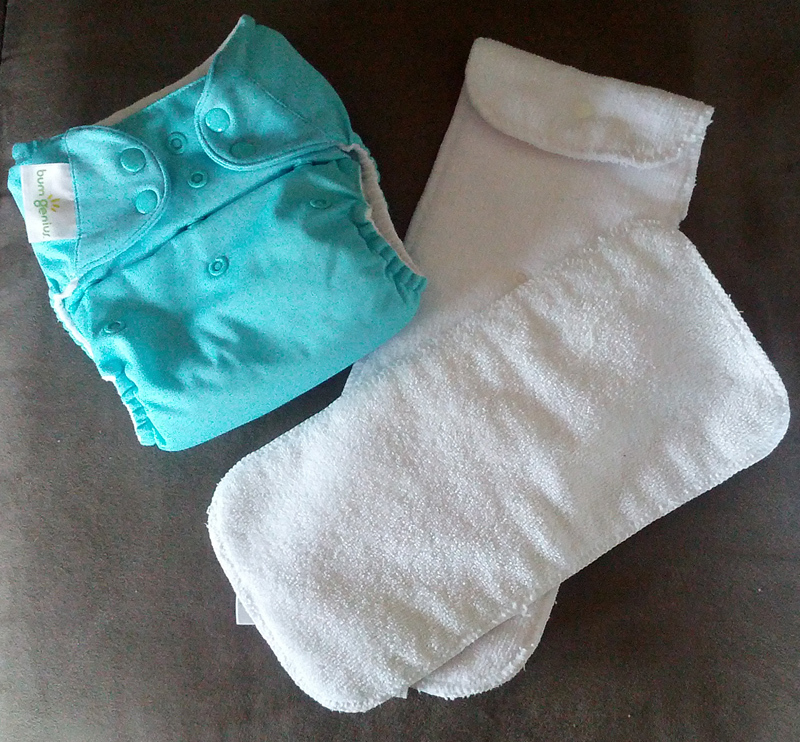 The pictures below show the BumGenius next to the inserts it came with and then next to the two different sizes of flat diapers (one-size and large) folded into the pad fold. They fit inside the diaper perfectly. I use my grandma’s diapers, but I have the advantage of modern diaper inventions. These make cloth diapering so much easier than it was for her. I don’t have to use diaper pins! 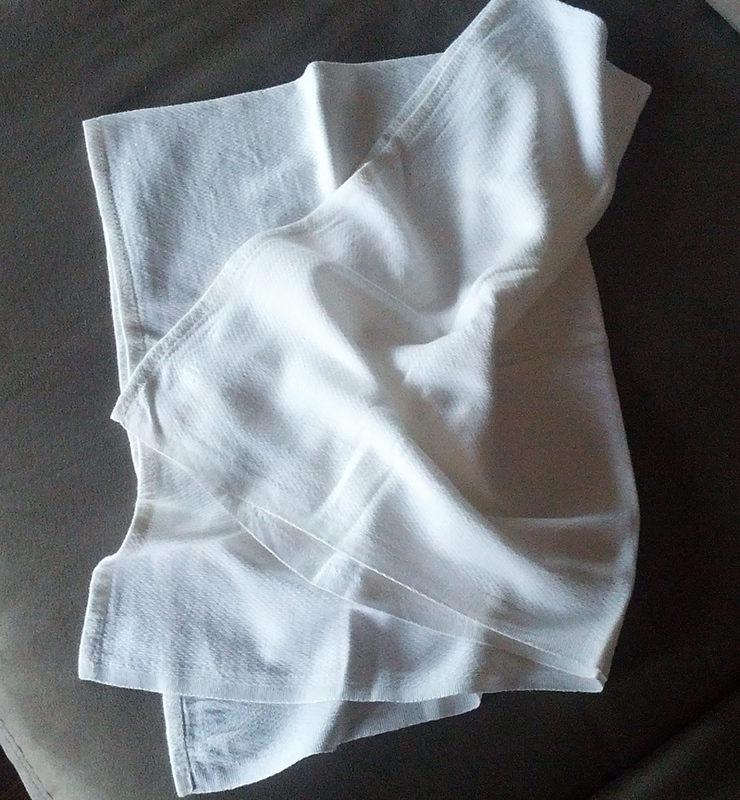 By using the pad fold in a cover or pocket diaper, I don’t even have to use a Snappy. I use the Flip covers most often. I can often reuse them without washing if the legs have not been soiled. They are easy to hand wash and dry quickly on the line. Each cover has three sizes to take the baby from birth to potty training. I have six of these in my diaper stash. I also have some BumGenius 4.0 One-Size diapers. These have the same features as the Flip cover, but they are a pocket diaper. This means that I put the pad fold inside the diaper. I have three of these, but looking back I probably didn’t really need to buy these. However, they are nice to have for my piece of mind at night. All of the layers are assured to stay together and there won’t be leaks in the morning. 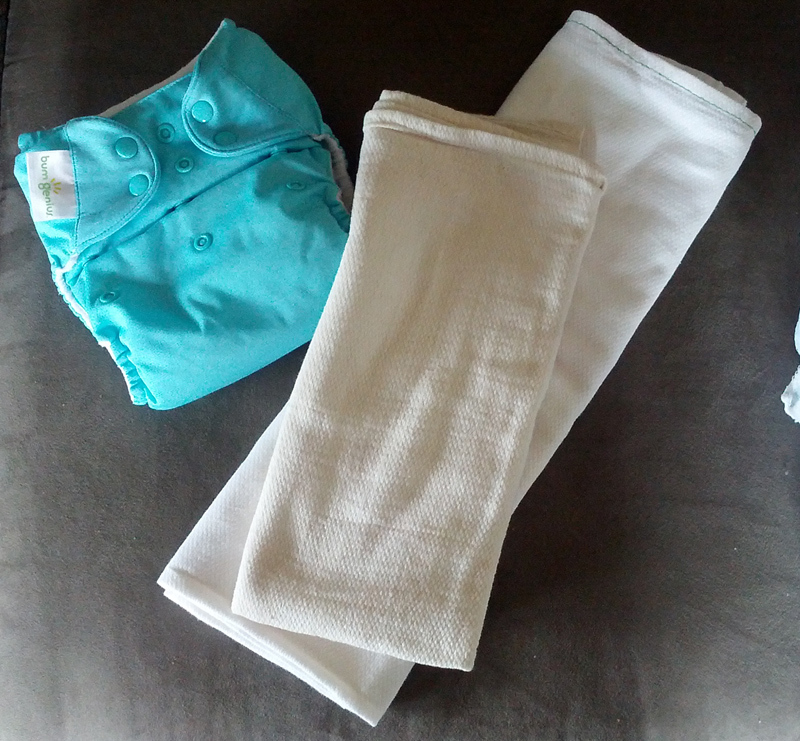 The disadvantage is that a pocket diaper can only be used once before it needs to be washed. This is a major disadvantage to me because I hand wash everything. How do I wash them? I do a pre-soak step as soon as the diaper comes off. I put it in a 5 gallon bucket to soak. When it’s time to wash, I squeeze the diapers out and dump the water. Then I wash them the same way I do the rest of my laundry, with my MobileWasher. I use a five gallon bucket set inside my bathtub. I “plunge” the diapers and soapy water for several minutes. Then they go through the wringer to get most of the soap and water out. After rinsing, they go through the wringer again. Then it’s time to put them on the clothesline. If you are prepping for a baby and need to consider the possibility of hand washing diapers, then the old-fashioned flat is by far the best choice. 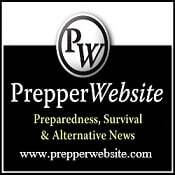 I wouldn’t use any other cloth diaper while living off grid. Next 5 Things You Need For Solar Energy! I was recently gifted with 5 BOXES of cloth diapers. I already have enough cloth to diaper twins, but they are not conducive to off-grid laundering b/c they’d take 3 days to dry on a line. However, the gifted diapers included flats & lots off them! I immediately thought of you, Jaimie, & these will definitely be added to my stash for future use. Thank you for your recommendations. 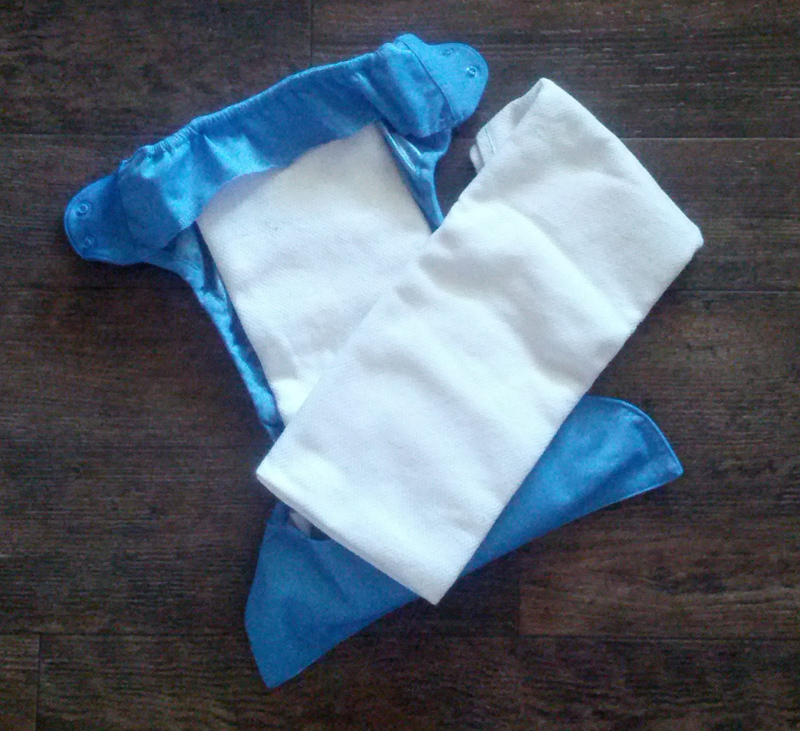 Thank you so much for this post, it is by far the most helpful thing I have read about cloth diapering ever. I live off the grid, no power and no running water. I am pregnant and plan to use cloth diapers and wash them by hand, but was so confused by all the fancy diaper options out there these days. I was wondering what kind of wringer do you have for your laundry, that is something ive been meaning to get in my life… certainly would make the laundry washing all the more easier. Thanks again. I found the best recipe for laundry soap ever! It’s smells wonderful, is very gentle, gets all stains out, even brightens the laundry, wonderful on diapers, even for soaking them until washed. Best of all it costs $1. to make for 10, that’s right, 10 gallons of laundry soap. It’s called Zote. I found many at the Dollar Store. You will need a pitcher with a spout and handle (Dollar Store) for pouring from a big 5 gallon bucket into a smaller bottle. I saved my old laundry soap plastic bottle to fill and use. A long thin angled at top funnel from an auto store for about $3 works well for pouring into plastic jugs too. The Dollar store also has latex free plastic gloves by the pack. I got my 5 gallon bucket at Lowes and the lid that costs a bit more that has a twist off center on the top. I’m in the bucket a lot and it’s much easier. You can use a long paint stir stick or a long spoon to stir. I found a stainless steel spoon with slots for $3 at Smart and Final. OK. Now you’re ready. Add one gallon of hot water (not boiling). Stir. It melts. Add two more gallons of hot water. Really stir it well. Now, just let it sit overnight at room temperature. In the morning it will be kind of like jelly. Now add two more gallons of hot water. Stir again really well. It’s that simple. It doesn’t bubble a lot. Now when you fill your container, remember it’s still double strength, so only fill it half full and add more water to top it off. It’s very concentrated. Then you can use it like you normally do. I use not quite a full cup per a load. I promise, you will love it. Your clothes will be so clean. It’s a great barter item! Once you start using it you will discover many more uses for Zote. I can’t list them all here, but you’ll find them on line. There are recipes for dish wash liquid too. It cut through the grimy film on my glass bathroom shower door like nobody’s business, no elbow grease required and no horrible fumes! 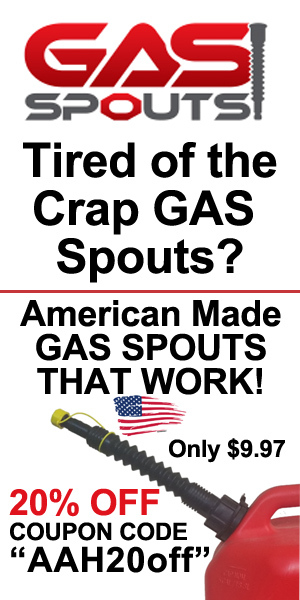 If you put a small chunk of Zote in your car or home, or tent the citronella keeps bugs away! You can rub some on the back of your neck or legs too. I even heard it’s useful as fish bate! There’s a recipe on line that involves adding a bit of bacon grease to it for lots of fishing bait. After I gave my Mom some, she never wants to use anything else! And she’s very particular about her laundry. She said, “It smells so good!”. I promised to keep her stocked. I bought several bars after I made my first batch. Zote is definitely a top preppers item, or for anyone who wants really clean laundry and to save money. Have fun making it. It’s great! I know this is a really old post, but what wringer do you use? All the wringers I’ve found online have terrible reviews!